Laying bare the soul…poetry and painting are done in the same way you make love; with an exchange of blood, a passionate embrace – without restraint, without any thought of protecting yourself. The picture is born…of an overflow of emotions and feelings. After months of intense Chinese studies, I was craving a good excuse to give my cramped fingers a break from relentless hours of practicing Chinese character strokes. Classes at the Beijing Language and Cultural Institute began each day with a drill of the 30 vocab words assigned the afternoon before. One lucky student of our class of 20 was randomly chosen to demonstrate the characters on the board while the others struggled to write them in their notebooks. 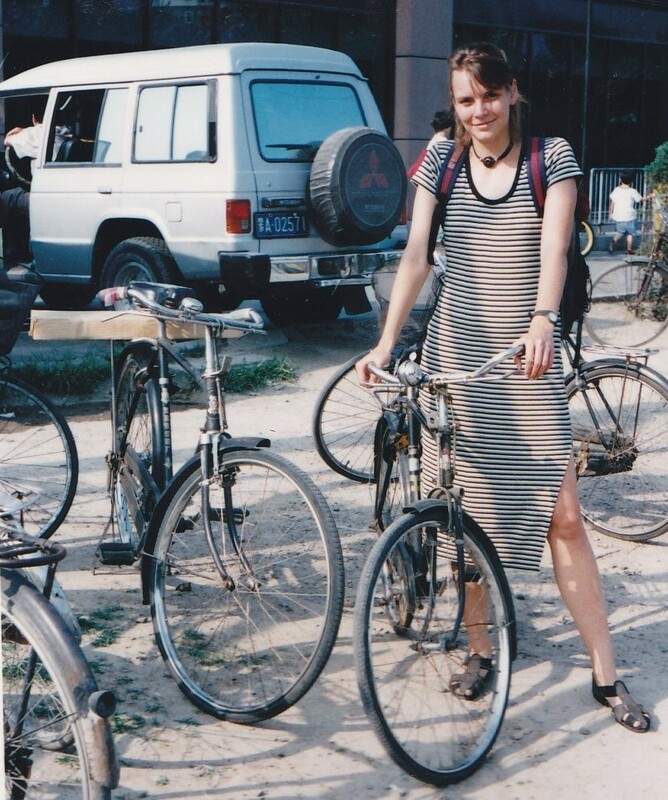 Since I had the good fortune of living 2 hours away from the institute at the charming last stop of the Beijing subway in a town ironically called Ping Guo Yuan (Apple Orchard supposedly existing somewhere beneath the shadow of a huge smoke billowing factory) and since a commute which entails a bike ride, a subway ride, a bus ride and then another bike ride, is often subject to various unforeseen delays, I was often a minute or two late for class. Which also meant that the Chinese-ified version of my name, which sounded particularly brutal at 8:03 am, was often the one called out for the daily public drill. Fortunately, the class consisted of every nationality possible and my French, German, Canadian and New Zealand colleagues tended to be far less judgmental of any errors than the three Japanese businessmen who always seemed to get everything perfect (the rest of us accused them of having an unfair language advantage). Chinese is a tough language to learn. Unless you’re a Japanese businessman. At least for me it was. First there is the whole Ting Dong stuff with the four tones. Assuming you manage to get those right – and let’s hope you do because a horse-mother mix up could cause quite a bit of awkwardness – you can move on to the next really tough part of Hanyu — writing. To get the characters right, you have to get the strokes right. 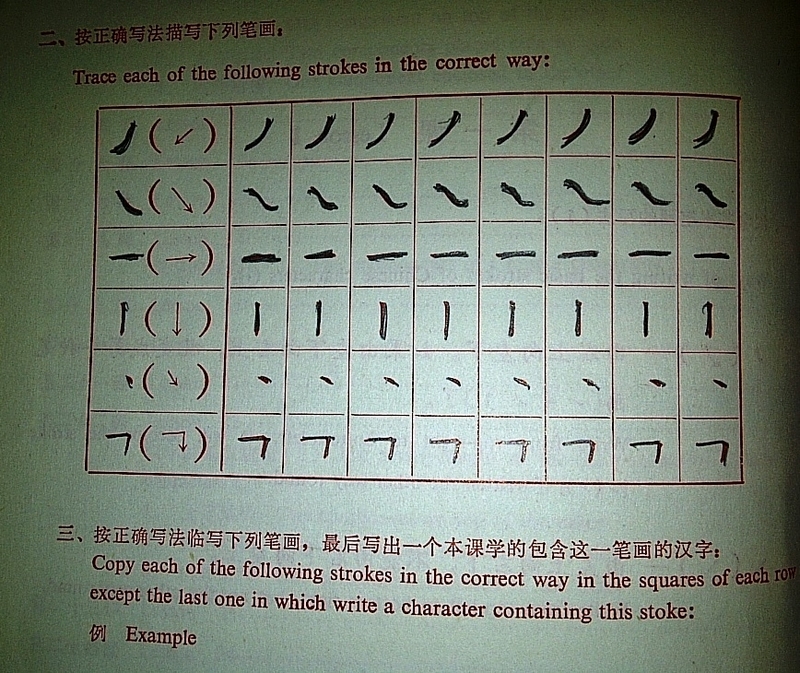 One Chinese word can have several characters and each character several strokes. Each stroke starts and ends in a very specific direction and are put together in a very specific order. All of this must be memorized and practiced, practiced, practiced. Any sign of rebellion – starting a stroke in the bottom right hand corner and moving upward and to the left, for example, is swiftly quelled by a stern reprimand by the Laoshi. Heck. I was even put in my place by a sweet looking but very strict schoolboy in a uniform seated beside me on the subway one morning. No doubt exasperated by the big nose lady (all foreigners in China have big noses, not just me) attempting a proper language that uses both sides of the brain, he gave me a vigorous head shake and stern look as he swiped away my homework notebook from me to demonstrate what I was doing wrong (and no, I wasn’t doing the homework the morning before class, it was the evening after, of course – just in case you were wondering. You believe me, don’t you? And just for the record, the English homework he was working on, wasn’t perfect either). 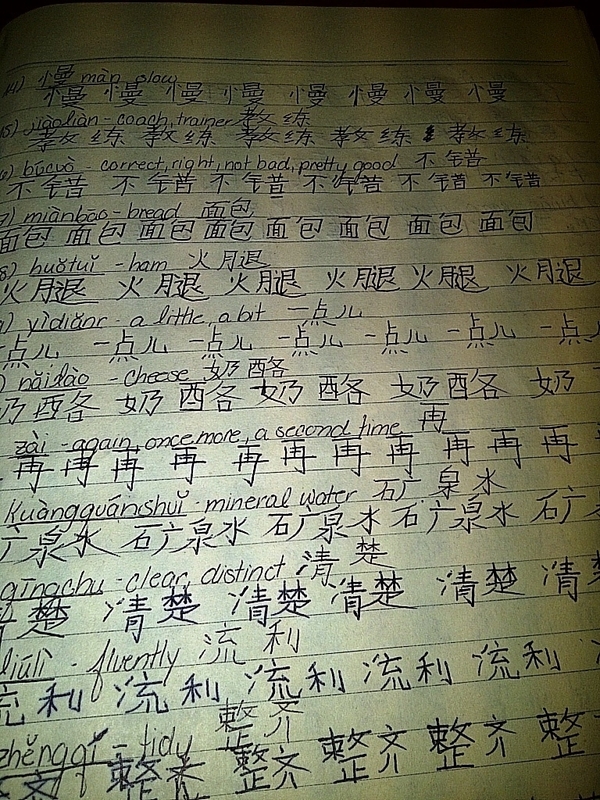 Needless to say, the art of learning Chinese is rigid. Very rigid. And after awhile, you start to feel a bit stifled. (Or maybe the mandatory start of every sentence with Tóng zhì (Comrade) causes that feeling.) 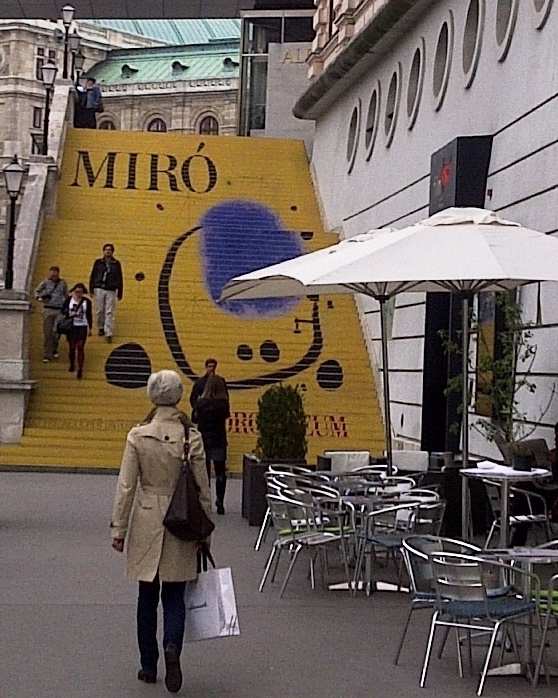 Whatever the reason, Miro entered my life at a time when I needed him most. Oh the complete and utter awe to stand before his paintings in a place so rigid with rules. Bold lines, incomplete forms, and off-set shapes. Yes, “Heaven is high and the emperor is far away.” Strokes going right to left, up to down, sideways and through figures. Eyes of different colors, hand prints here and there and chickens afloat. Nothing conformed. Nothing matched. Every painting was free. Rebellious. Without restraint. Fire in the soul. 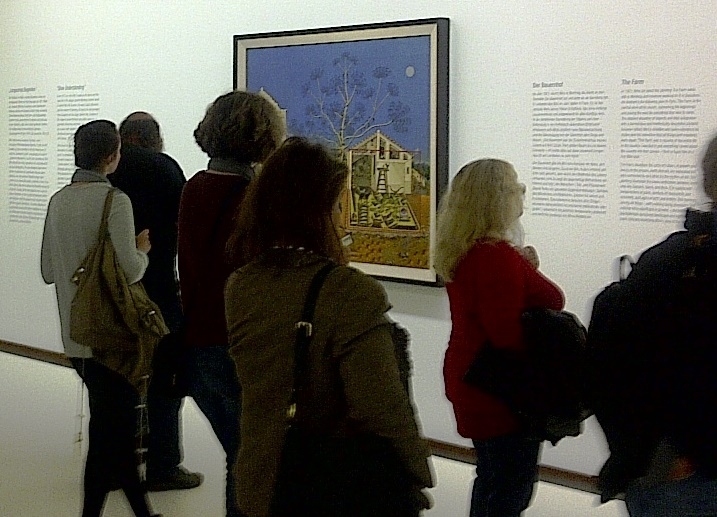 This past Saturday, as I visited Miro’s masterpieces once again, years after my first encounter, I learned about the Spanish artist’s past and close encounter with a missed fate. How his family had pressured him to work as an accountant for two years before he had a nervous breakdown and retreated back to his family’s farmhouse to paint. I learned that he spent nine months in Paris, poor as a church mouse, working endless hours on a painting entitled, The Farm, that Hemingway insisted on buying (after going bar to bar to scrape together enough money to do so). What if he hadn’t had that breakdown? What if he hadn’t gotten through the rough times and kept painting? 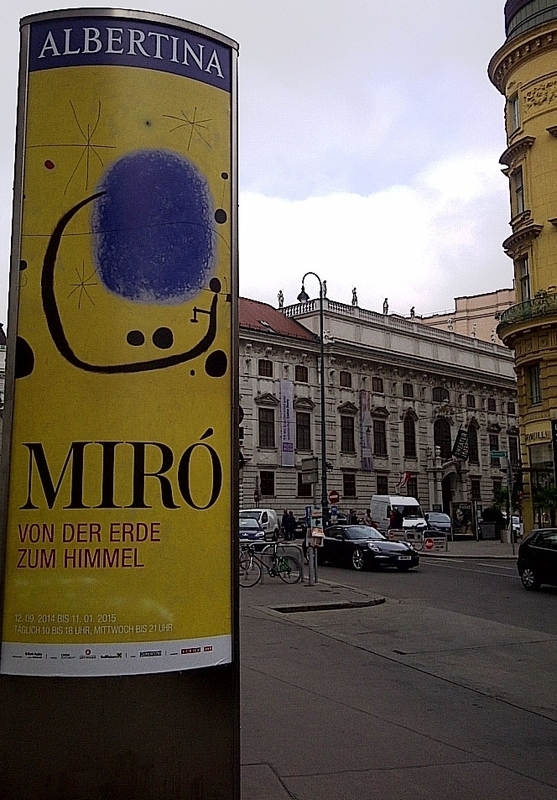 What if the world never got to see Miro’s paintings because he kept accounting or because he gave up and did something other than slave over a Farm painting for 9 months? 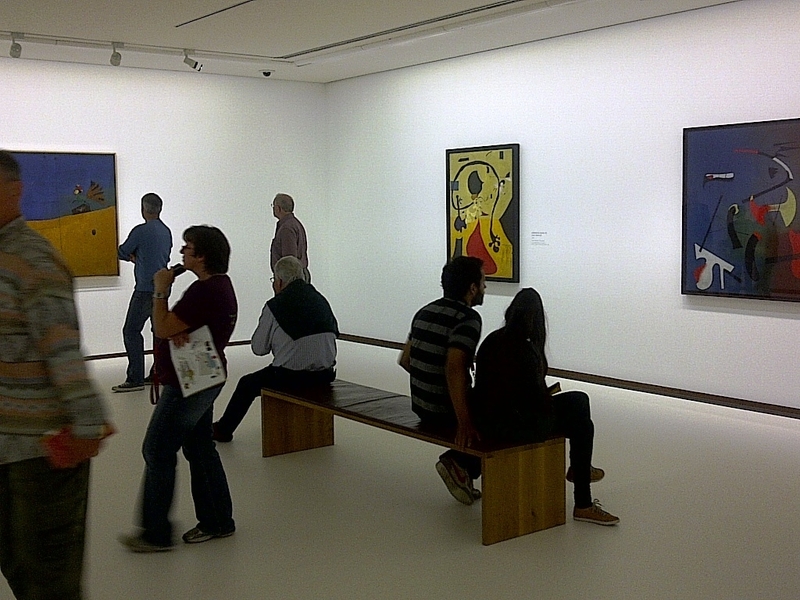 Joan Miro could hear the voices telling him what to do but thankfully they made no sense to him. A stronger, clearer inner voice spoke louder and truer to his artist soul. Tóng zhì ta ting bu dong.